Thousands of people marched in Argentina on Thursday to protest hikes in water, electricity and natural gas prices, Anadolu Agency reports. Many joined the call to protest by workers’ and teachers' unions as well as political parties and non-governmental organizations. People gathered in the main square in the capital Buenos Aires and walked to the National Congress. 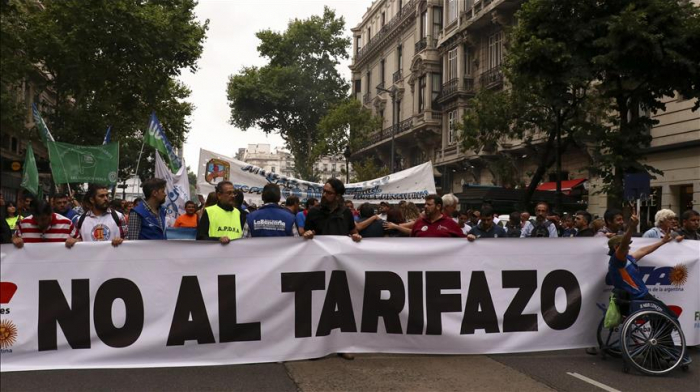 Protestors shouted slogans over the price hikes, addressing President Mauricio Macri and other politicians. Some of the demonstrators carried torches during the march. Many streets were closed to traffic due to the protest and public transportation in the city was disrupted. Anti-government demonstrations are expected to be held in different parts of the country every Thursday until Feb. 7. In December, it was reportedly announced that electricity prices would be gradually raised by 55 percent in 2019, water prices would increase 38 percent and public transportation fees would climb 40 percent in the capital city, with a population of 13 million, while the hike in the natural gas price would reach 35 percent on a national scale.